“Elementary lined paper” can be a pretty open ended description. Here’s what you’ll find in this section (hint, it’s almost every type of writing paper you might need! ): Primary lined landscape paper and primary lined portrait paper with primary writing lines (red base line, dashed mid line, blue top line) in seven different line widths with three types per line width – a page with lines only, a page with a line for a name, and a page with a line for a name and a box for an illustration. The white lined paper includes college ruled lined paper, wide lined paper, and spelling paper. Please go to this page to choose from all the writing resources on this site. Children who are just learning to write need paper with big wide lines and a midline to help them write their letters correctly. As kids get older they still need the lines to write neatly. 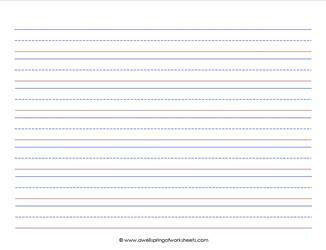 In three line widths, this primary lined paper also comes in three types: a plain page, a page with a line for a name, and a page with a box for illustrations. 18 pages in a portrait orientation. For kindergarten through third grade. These pages are just what you need to create a journal or special class book for your kids! They are just right for every day writing assignments, too. 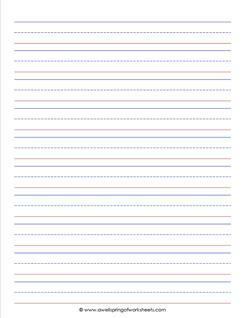 In each line width (there are six of them), this primary lined paper also comes in three types: a plain page, a page with a line for a name, and a page with a box for illustrations. Each page description tells which grade it’s appropriate for – kindergarten through third grade.